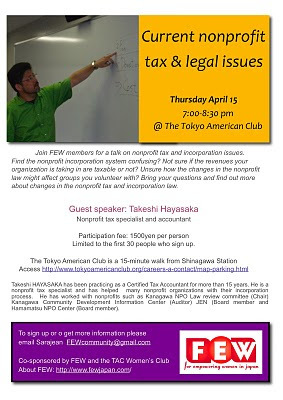 You can also bring items to the May members meeting on Thursday May 13. Please send only the following items – others will be returned. Types: Mostly play clothes such as shorts, t-shirt, and skirts, and fleeces are very popular as well. Sizes: All sizes: small, medium, large, extra large. All items should be new or nearly new and dry-cleaned. UPDATES AND NEWS: New courses starting after Golden week! 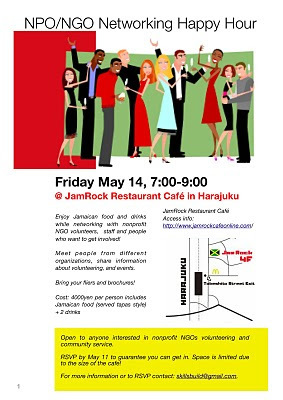 NPO/NGO Networking Happy Hour: Open to nonprofit NGO volunteers and staff and anyone who wants to get involved in community service. Meet people from different organizations, share information about volunteering, and events. Bring your fliers and brochures! Contact rose.ito@gmail.com skillsbuild@gmail.com to reserve you place! 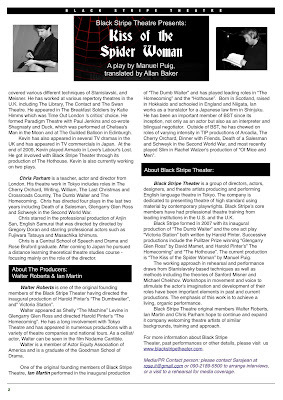 Friday April 16 (7.30 pm), Saturday April 17 (2.00 pm & 7pm), Sunday April 18 (2 pm & 7.30 pm). The nearest station is Ushigome-kagurazaka (Exit A3) on the Oedo Line. sorry but this is postponed! 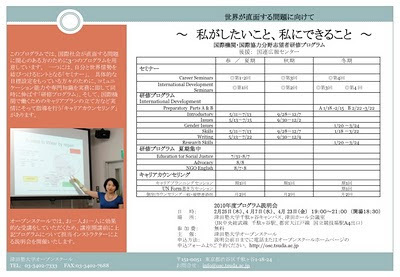 All courses are run in English but information on program is in Japanese only. It’s the 40th anniversary of Earthday! Earth Day 40 is a pivotal opportunity for people, corporations, and governments to join together to create a global green economy. Our coordinated efforts now will be recognized by future generations as a turning point. Earth day was designed to inspire awareness and appreciation for the environment. It was founded by U.S. Senator Gaylord Nelson as an environmental teach-in 1970 and is celebrated in many countries every year. The first Earth Day was in 1970. The United Nations celebrates Earth Day each year on the March equinox - founded by peace activist John McConnell in 1969. The United Nations first celebrated Earth Day on the March equinox in 1971. This was also the first time ever that the United Nations celebrated Earth Day. The Earth Day on the March equinox was also in 1970. Each year more than 100,000 people join earth day Tokyo events. This years the organizers aim to make it the biggest Earth day ever!